Portland Trail Blazers handed the San Antonio Spurs their third straight loss with a 127-118 victory. Author: By ANNE M. PETERSON , AP Sports Writer. 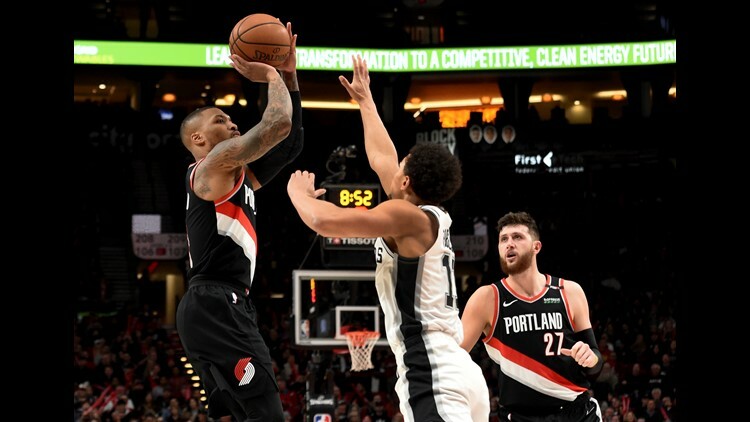 PORTLAND, Ore. — PORTLAND, Ore. (AP) — CJ McCollum had 30 points, including seven 3-pointers, and the Portland Trail Blazers handed the San Antonio Spurs their third straight loss with a 127-118 victory on Thursday night. It was the second straight game that McCollum has had seven 3s, which match his career high. With his second 3-pointer, McCollum passed Terry Porter for third on Portland's all-time list. Portland led by as many as 21 points early in the third quarter but the Spurs rallied to tie it at 88. The Blazers led 96-90 going into the final period and extended it to 108-97 when Lillard found McCollum in the corner for a 3-pointer with 7:39 to play. Rodney Hood's 3 gave the Blazers a 125-110 lead with just over two minutes left. Hood, acquired by the Blazers in a Sunday trade with Cleveland, made his debut in Portland with 4:09 to go in the first quarter. He finished with 14 points. The Trail Blazers also sent forward Caleb Swanigan to the Sacramento Kings in exchange for forward Skal Labissiere just before the deadline Thursday. Labissiere, taken 28th overall in the 2016 draft by the Kings, was averaging 2.8 points and 1.8 rebounds in 13 games this season. He was not available to play Thursday night. The Spurs did not make any moves prior to the deadline. Hood's running jumper gave the Blazers a 49-48 lead midway through the second quarter. Portland extended the lead to 67-54 after Al-Farouq Aminu's layup and led 70-57 at the break. Jusuf Nurkic led all players at the half with 14 points for the Blazers. The Blazers extended the lead by as many as 21 points in the third quarter, going up 84-63 on Lillard's step back jumper. But Rudy Gay made three straight 3-pointers to get the Spurs back within 86-74. The Spurs went on a 25-4 run, capped by DeRozan's jumper that tied the game at 88. Gay had 16 points in the third quarter, including four 4-pointers. He finished with 25 points. LaMarcus Aldridge had 17 points and 10 rebounds for the Spurs against his former team. The Portland Trail Blazers have announced some of the plans for next season's 50th anniversary, including a special logo and a preseason game at the team's old arena, Memorial Coliseum. There will even be a commemorative Trail Blazers Pinot Noir in partnership with Oregon winemaker Adelsheim Vineyard. Mayor Ted Wheeler said the Blazers represent the "ethos of what we have to offer: our pioneering spirit, our perseverance, and our trail-blazing mentality." Spurs: San Antonio remained without Derrick White because of a sore right heel for the third straight game, although coach Gregg Popovich said before the game that he expected White to be back "pretty soon" after the All-Star break. Trail Blazers: The Blazers sent Nik Stauskas, Wade Baldwin and two future second-round picks to the Cavaliers in exchange for Hood. Stauskas and Baldwin were traded three times in five days before they were waived Thursday by the Indiana Pacers. ... Portland outscored the Spurs 39-23 in the second quarter. ... Portland improves to 2-1 against the Spurs this season. The Spurs visit Utah on Saturday night. The Trail Blazers visit Dallas on Sunday.